If you are a budget traveler, you need to set a budget and keep to it. But how do you do that? I usually research the average costs for the destination and keep track of my expenses while I travel. In order to learn from me, I give you my costs for a weekend in Alicante. This way you do not have to do any research anymore. 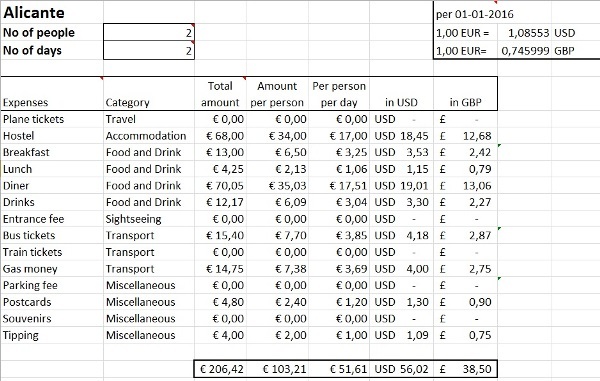 I breakdown the costs into categories and give you an Excel overview and % breakdown diagram. Curious? Let’s crunch some numbers and see how much I’ve spent on a weekend in Alicante, Spain. What were our costs for a weekend in Alicante? We spend 2 days/2 nights in the city of Alicante, Spain. We arrived Friday evening and left Sunday morning. We were a couple, traveling together and splitting the costs. Our main goal was to escape winter in Alicante. 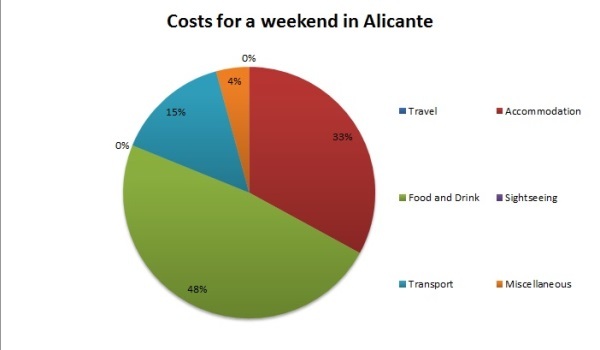 Our costs for short weekend in Alicante can be divided as following. Basically the main reason to go to Alicante. I was offered a great deal on 2 return flights to Alicante for the total costs of €0,00. Yes that’s right. I paid zero. Nothing. Nada to stay with the Spanish. Of course, not the whole trip was for free. We still needed to find a place to stay. As we are trying to spend as less as possible, but still have a good night sleep, we booked 2 nights into a hostel downtown Alicante. We stayed in X-Hostel in Alicante. 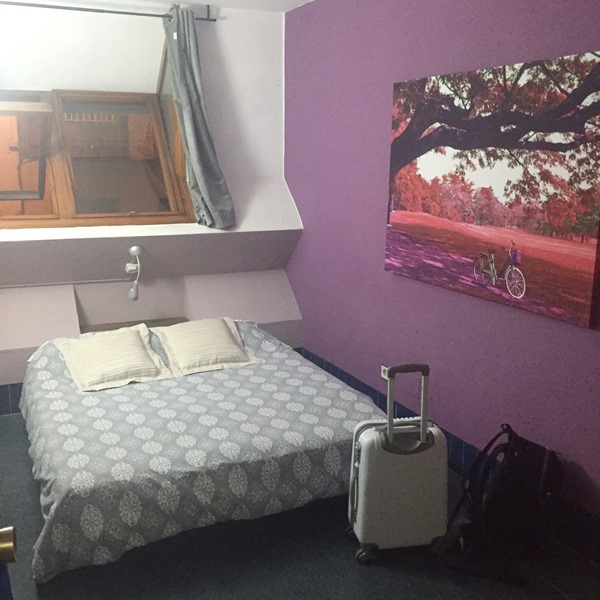 We booked 2 bed private bedroom with shared bathroom for €17 per person per night. Room for two in the hostel. We did have a breakfast included with our stay at the hostel, but we didn’t use it. We arrived Friday evening and went out for dinner and some drinks and came back to the hostel late. As we had worked all week, we decided to sleep in and missed breakfast. The 2nd breakfast we missed, because we had to get up early and leave for the airport again. What did we have for breakfast? We went to the central market and found an artisan bakery nearby. We bought some fresh bread which the lady cut up in 4 pieces and open for us. In the supermarket we bought some meat and cheese and orange juice. We spend €4,80 on this breakfast. As we got up late the first day, our breakfast was more or less our lunch. 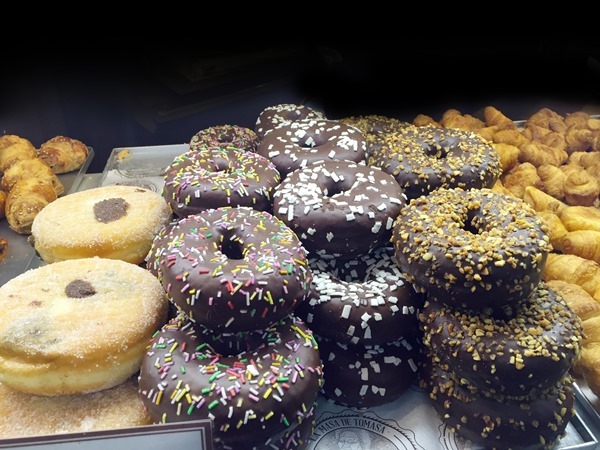 We did have some late afternoon snacks which consisted of a doughnut and some chocolate stuffed pastries. We had some drinks at the Santa Barbara Castle and at the promenade. We took our time and enjoyed our lazy pace. We went out for dinner straight when we arrived. 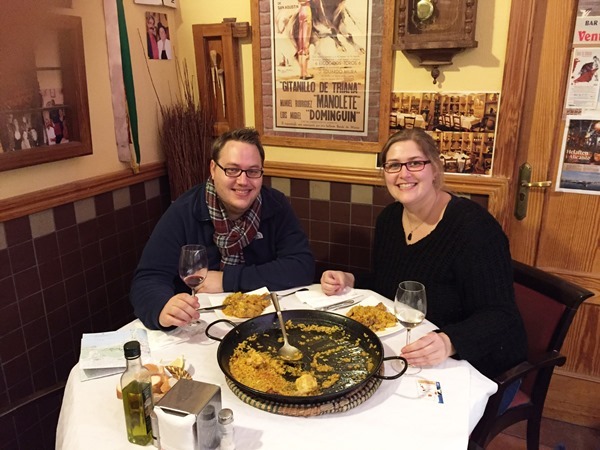 Our hostel recommended a great place to eat paella and so we set out to Taberna Iberica for the paella menu. We had some tapas for starters and the main dish: the rabbit and chicken paella. We enjoyed some wine with dinner too. We paid a total of €44 for two menus and 4 glasses of wine. The sightseeing part was easy. We didn’t spend any € on this. We set out to climb the Santa Barbara Castle and enjoyed being outside. We took the lift down from the castle which was free. If you don’t feel like climbing the castle, you can take the lift up, which will cost you €2,70 per person. 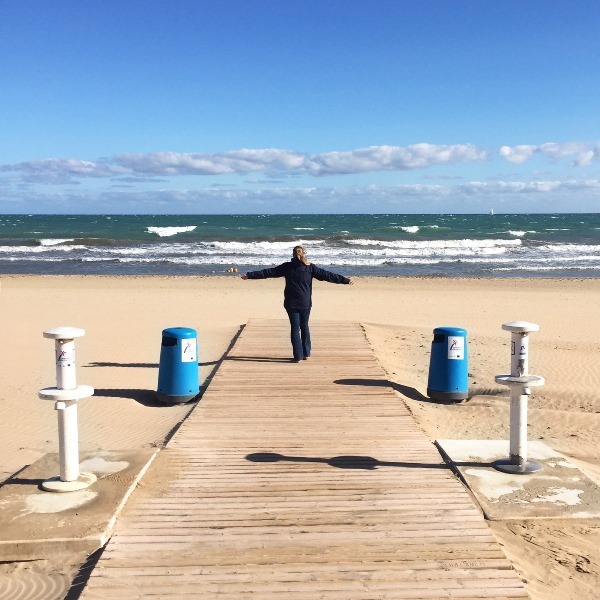 Check what else we did in my blog: 6 ways to escape winter in Alicante. We enjoyed the beach and walked across town. As we had little time, we just wanted to be outside to escape the winter. Although we didn’t do much, we did have to take the bus from the airport to the city of Alicante. The bus can be found at the 2nd floor of the airport, at the departures. The bus runs every 20 minutes between 6.00 and 23.00h which is really convenient. The bus to the city (train station) took about 40 minutes. We paid €3,85 each. Unfortunately, there was no deal on a return ticket or anything. The fare is per person, single way. As we walked everywhere else in town, we didn’t spend any money on taxis or buses around town. I almost walked 30.000 steps while in Alicante. I think the above sums things up pretty nicely. But there are always some hidden costs for a weekend away. You have to keep that in mind when budgeting the costs for your trip. They might not be specific costs for a weekend in Alicante but I want to be complete so I throw them in anyways. We had to drive 230km to get to the airport and back. This costs about €15 for gas money. Total costs for getting to the airport at home: € 14,75/ per person €7,38/ per day €3,85. We didn’t buy any souvenirs but I do have a habit of buying postcards and send 1 to my parents. We weren’t sure on the right etiquette for tipping in Spain. Because of this, we just rounded off to the nearest euro whenever we had to pay for some things in a bar or restaurant. It did add up to a few euros. Going to the beach is free! We really had a brisk visit to Alicante. Mainly because the plane tickets were for free. This gives a bit of an odd % deviation but I hope I was able to offer some insight in the costs for eating and exploring the city. Still not very budget but a lot better than our recent Dublin expense report. Again, lodging and food were the main costs for our weekend in Alicante. Below a breakdown in percentage. The 0% for travel is not visible. Percentage breakdown of the costs. If you want to know more about my travel expenses, read my costs for a short weekend in Cologne report and my Weekend in Dublin expense report. What do you think? Do you think we spend too much money? Do you keep track of your expenses while travelling? Please share your experiences below in the comment section. Not bad, don’t you think Hviezda? Did you travel to Alicante too? Did you find it expensive?